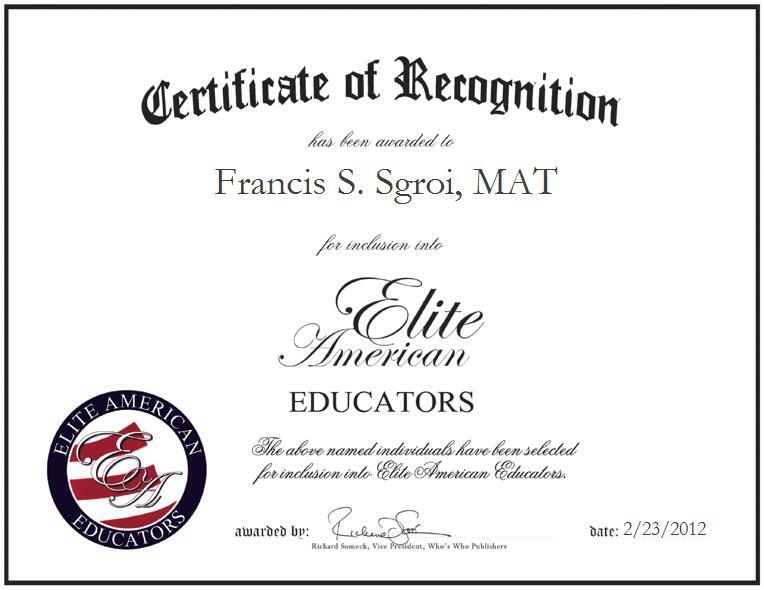 DELRAN, NJ, February 23, 2012, Francis S. Sgroi, MAT, Mathematics Department Chairman for Holy Cross High School, has been recognized by Elite American Educators for dedication, achievements, and leadership in mathematics instruction at the secondary level. At the helm of the prestigious high school’s mathematics department, Mr. Sgroi is responsible for teaching five classes, which include honors precalculus and geometry, attending the annual seventh and eighth grade math competitions, and handling block scheduling. Mr. Sgroi, ever determined to instill in his students an excitement about education and a love for mathematics, has garnered a reputation of distinction among his professional peers; in 2008, he was named the Holy Cross High School Teacher of the Year, in 1978, he was named among the Who’s Who of the East. He has also received the Tandy Technical Scholar Award, and been named the Most Influential Teacher by the staff of the school’s yearbook. Over the course of an illustrious teaching career, Mr. Sgroi has counted a number of accomplishments and triumphs as an educator. He recently earned his Master’s Degree plus 30 credits, which is the equivalent of a Doctorate Degree, at the age of 57. Mr. Sgroi was the head coach for the girl’s varsity soccer team, Lady Lancers, at Holy Cross for 17 years. They won the New Jersey State Championships in 1993 and 1995. In the years to come, Mr. Sgroi intends to continue to spread his knowledge and encouragement. He may do volunteer work in the field of education.